The Boeing name has been synonymous with bombers for more than 70 years, with a long line of heavy-hitter designs that dates back to the Monomail-based B-9 of 1931. The B-17, B-25 and B-29 were at the forefront of Allied bombing offensives in World War II and the B-50 in U.S. action in Korea, while the B-47 ushered in the jet bombers of the Cold War. Today, Boeing can lay claim to two of the three U.S. Air Force bomber designsthe much-venerated B-52 and the increasingly versatile B-1Bas well as a one-third share in the stealthy B-2. In recent years, the bomber has staged a remarkable comeback with the U.S. Air Force. Once viewed as little more than a nuclear relic of the former Cold War, the bomber is once again front and center on the airpower stage, as a result of recent conflicts in the Balkans, the Middle East and central Asia. With no clear consensus on when or with what the U.S. Air Force will eventually replace the B-1, B-2 or B-52, the expectation is that this troika will remain on the front lines for at least 40 more years. That puts into the spotlight about 1,000 Boeing Integrated Defense Systems people in Southern California, Oklahoma, Kansas and Washington state and at Air Force bases across the United States who are helping sustain the bomber fleet's combat effectiveness now and into the future. The Boeing bomber community is also a key contributor to the company's Global Strike Force that is trying to determine the shape and makeup of the U.S. Air Force's future strike capability. 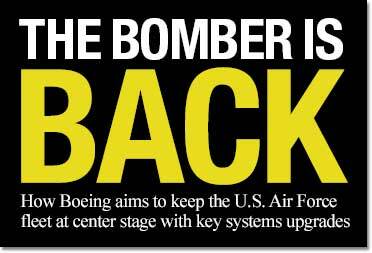 "We've been in the bomber business for a long time, and we're going to be in it for a long time to come," said Scott White, Boeing IDS general manager of the B-1 and B-2 programs. "There won't be an automatic replacement for the B-1 or B-52, but rather an eventual transition to something else." Two fundamental advances have combined to turn around the bomber's fortunes: the development of stealth or low-observable technology in the form of the B-2, and the addition of precision-guidance weaponry. Today, the U.S. Air Force has 60 B-1Bs, 21 B-2s and 94 B-52Hs. Although this force represents a 47 percent contraction since 1992, it's 10 times more potent in terms of target kills per sortie, thanks to weapons such as the Joint Direct Attack Munition, the Joint Stand-off Weapon, the Wind-Corrected Munition Dispenser, and soon the Joint Air-to-Surface Stand-off Missile. Indeed, during Operation Iraqi Freedom, the 11 B-1Bs, four B-2s and 28 B-52s deployed to the region accounted for one-third of all targets that were struck. "The bombers are proving to be extremely high-leverage assets with the trend toward few aircraft but a significant proportion of the total tonnage dropped," observed Rich Parke, Boeing IDS director of B-1B Advanced Programs. Operation Iraqi Freedom highlighted an increasingly important feature of bomber missions: the need for en route retasking. A well-publicized example of this was the retargeting of a JDAM-laden B-1B over Iraq to attack a suspected Saddam Hussein meeting placeall completed within 12 minutes. The B-1B currently relies on UHF satellite communications, ARC-210 radios and "quasi-networked" low-bandwidth data links to receive target updates. The U.S. Air Force wants to further reduce the time between target detection and destruction by better plugging in bombers to network-centric operations. The B-1B is scheduled to receive the Joint Tactical Radio System, and a small number of aircraft will get Link 16 data links and laptop displays. (Link 16 is an overriding Department of Defense term that describes various Fighter Data Link systems to allow high-capacity, secure data links between fighter aircraft, command and intelligence aircraft, ground stations, and U.S. Navy, U.S. Air Force and U.S. Army assets.) The ultimate solution lies in a fully integrated data link, along with a proposed new digital glass flight deck. This will permit "single-picture" displays, in-flight mission planning and real-time overlay of target and threat information. The B-52H fleet is about to embark on its own Avionics Modernization Improvement. This includes replacement of obsolete 1970s-era avionics, which are the equivalent of Commodore 64 computers in terms of processing power, with a faster, more powerful and reliable control unit. The aircraft's Inertial Navigation System will be replaced by Ring Laser Gyro technology. The AMI provides a digital building block for further enhancements. The next step is a proposed three-phase CONECT upgrade program to hook the B-52H into network-centric operations. This will include new flight deck glass displays, the addition of either Link 16 or Joint Tactical Radio System, and the new Family of Advanced Beyond Line-of-Sight Terminal now in development. "This will provide a wide-band, high-speed pipeline into the aircraft and provide for onboard retasking and in-flight replanning," said John Kegley, Boeing IDS director of B-52H Business Development. The second major enhancement to the bomber now in concept definition is an Airborne Electronic Attack role for the B-52H. This builds on earlier development work done under the Situational Awareness Defensive Improvement effort and adds a receiver and outboard under wing jamming pods. The intent is to fully equip B-52s for the AEA mission to supplement the U.S. Navy and U.S. Marine Corps' overtaxed and aging fleet of EA-6B Prowlers. Because of connectivity and the emergence of GPS-guided weapons, the U.S. Air Force has been able to use its bombers in ways that no one could foresee, such as providing tactical air support to fast-moving forces on the ground. There is now a push to add Electro-Optical/Infrared targeting pods to enable the B-1B and B-52H to positively identify targets and drop laser-guided bombs. 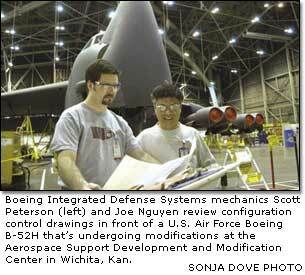 An EO/IR pod already has been demonstrated on the B-52, while plans to equip the B-1 are being finalized. Certification of the JASSM missiles on the B-1B is nearly complete and due to begin fielding on the aircraft in July. The B-52H is the only Air Force bomber equipped to carry the AGM-86 Conventional Air-Launched Cruise Missile, AGM-84 Harpoon and AGM-142 Havenap. However, its external stores stations are wired only to take the latest generation JDAM, JSOW and JASSM. IDS' Kegley is hoping to open up the internal weapons bay to carry forthcoming new smart weapons. Boeing IDS is under contract to make software and hardware modifications to convert the B-2's four internal bomb racks into smart racks to carry the 500-pound version of the JDAM. The weapon attracting the most attention is the new 250-pound Small Diameter Bomb. The B-1B can carry up to 96 SDBs and the B-52H can carry 80. A follow-on version of the SDB, with enhanced guidance to hit moving targets, is earmarked for the B-1B in concert with a planned upgrade of the aircraft's ALQ-164 radar. "The radar upgrade would combine off-the-shelf receiver, processor and transmitter technology, already developed for fighters like the F/A-22 and F-16, with the B-1B's existing mechanically scanned antenna," Parke explained. "The result is a much improved Ultra High Resolution/Synthetic Aperture Radar." The B-1B, armed with the improved SDB, would then be able to track, target and engage multiple moving targets. Structurally, there is no reason why the current U.S. Air Force bomber fleet cannot fly on until 2040. With some attention to wing skins, the aircraft could fly well beyond that date. Even though the last B-52H rolled off the Boeing production line 42 years ago, the fleet on average has used up only slightly more than half of the 30,000-hour airframe lifetime. With many of the original parts no longer in production, sustainment is the main challenge. "We have developed with the Air Force an Aircraft Sustainment Roadmap to look at and predict where we're going to have failures and problems," said Scot Oathout, Boeing IDS program manager for the B-52. "This is a very detailed look at every element of the aircraft." This has resulted in the design of new flap drive screws and the replacement this year of the aircraft's air refueling receptacle. During a recent inspection at Tinker Air Force Base, Okla., the Aircraft Sustainment Roadmap was the only identified "best practice." 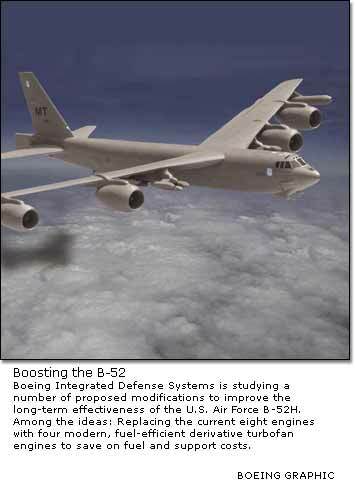 Perhaps the biggest modification currently under study is a Boeing proposal to reengine the B-52H with a more modern and fuel-efficient derivative of a civil turbofan. The main driver is cost. The estimated savings in spares and support over the remaining life of the bomber are expected to more than pay for the modification. The Boeing study centers on replacing the current eight Pratt & Whitney TF-33s with a like number of 20,000-thrust-class CFM56, Rolls-Royce BR715 or PW6000 engines. An alternative is to re-equip the bomber with four larger, 40,000-pound-thrust PW2040 or R-R211-535 turbofans. The B-1B community is also looking at reengining, but for a slightly different reason. Recent combat experience has shown the need for higher-altitude performance to put the bomber beyond the reach of all but the largest of surface-to-air missiles. The preferred solution is to use the PW F119 engine that currently powers the F/A-22. "The idea has also got NASA excited," Parke said, "as it will allow for the test-dropping of weapons at supersonic speeds, and perhaps provide a lead-in to the next-generation long-range bomber." The Boeing IDS Bomber Council is continually evaluating the modernization roadmaps for the existing bombers for relevance and synergy, and to identify common requirements, solutions, tools and processes. By sharing tools and lessons learned, the Bomber Council is reducing program risk and cost on computer and communications upgrades, and weapons integration. "As the network-centric and other enhancements are incorporated into the jets, the Bomber Council is looking for more synergy and value for our bomber customer," Parke said. "This will help ensure the viability of the bombers and maintain Boeing as the 'bomber company' for at least another 60 years."